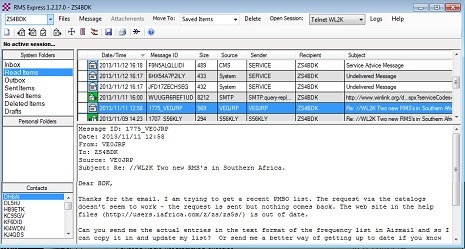 RMS Express SSB HF email client. There are two new WINMOR Winlink 2000 HF SSB Email servers in Southern Africa. Also one new RMS in Chile, South America. With Winlink 2000, you can send and receive emails and all kinds of attachments, such as text files, charts, weather forecasts, GRIB files and pictures. All for free, or a small gratitude donation to the developers. From the High Seas with no Internet around for hundreds of miles. The African stations operate on both WINMOR and Pactor. Please update your Airmail channel list. Download the free WINMOR (RMS Express) sound card TNC software. No Pactor TNC is required for WINMOR. Download and install all files. The interface between the computer and the radio, is the Signalink USB. Or any ham radio digital mode interface with PTT. Or any homebrew interface with PTT. Use an external computer microphone to listen the radios's speaker. Use the radios's microphone to listen to the computer's speaker cross-wise. Turn the radio's VOX on. Set the VOX delay to minimum. Keep the environmental noise low. You need an amateur radio licence to transmit on these frequencies. We were just discussing the open source station software for Winmor and wondering how large the network has grown. Clearly, the successful use of Winmor comes down to having enough stations out there. Are the stations becoming more common? Love to know your thoughts on it. WINMOR is very prominent in the US now, due it's popularity with the Emcomm crowd. The rest of the world is lagging behind a bit, because they are not so scared of their own shadows.... - Look at the WL2K website Universal Server Map. Consequently, it takes a great effort to create the need for WINMOR RMS's the world over for sailboat use. I have been actively involved in this, and I am proud of "my" three stations above. Seems that it is easier to make the case for Pactor, since many users/RMS's are also involved in the sales of SCS TNC's...Thus more exposure. It is my contention that WINMOR, although slower than Pactor, will become the base mode for WL2K in the undeveloped world. With the dismal present day propagation, there are huge WL2K black holes all over the Globe. Case in point is Africa and South America, as well as the Southern and Northern Oceans. Add to this the fact that many countries' radio laws are way out of date with modern digital technology, and it is easy to see the work that lies ahead. Hopefully we will soon see 2.8 KHz Pactor 4 and WINMOR in the U.S.
A WINMOR RMS is so easy to set up nowadays with the new FREE, Hybrid RMS Trimode server software. The Hybrid RF/Internet system already works very well in Africa due to their very regular rolling power and Internet outages experienced there. In fact, those African WINMOR/Pactor RMS's are fast becoming a very interesting test bed for the whole Hybrid concept. Could be done, if the " legal " issues could be bridged. I've never heard of this. Are you saying your able to use a ham radio to interface a computer to the internet? If so were do I find out more info? But email, attachments, large text files, spreadsheets, GRIB files, satellite weather pictures, maps, etc. How-to videos for RMS Express (WINMOR) HF SSB Email. Here is a link to some excellent videos by K4REF, explaining step by step how to set up the free RMS Express software for email via HF and VHF radio. This is computer sound card software. No Pactor TNC is needed. There are four Winlink 2000 WINMOR HF radio email servers in and around South Africa now. Excellent WINMOR Winlink 2000 email via radio guide. Here is an excellent guide for the Winlink 2000 email via HF radio system, using the free WINMOR (RMS Express) computer sound card software.